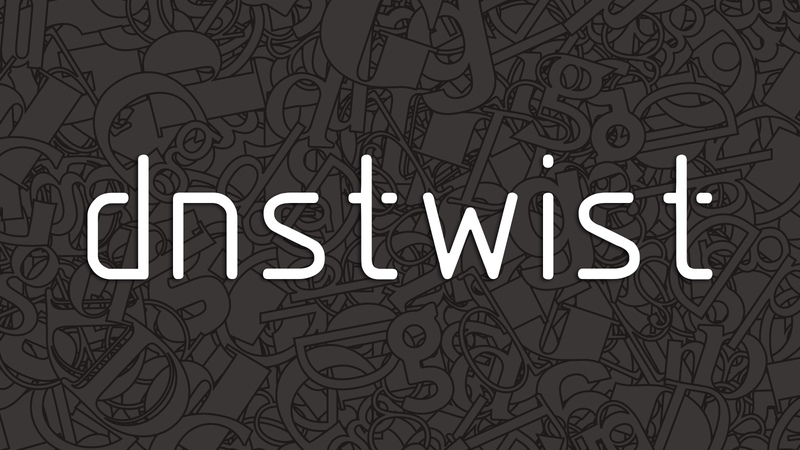 dnstwist is a Python-based tool that can help you see what sort of trouble users can get in trying to type your domain name. It can find similar-looking domains that adversaries can use to attack you. It can also detect typosquatters, phishing attacks, fraud and corporate espionage. It is very useful as an additional source of targeted threat intelligence. The idea is quite straightforward: dnstwist takes in your domain name as a seed, generates a list of potential phishing domains and then checks to see if they are registered. Additionally, it can test if the mail server from MX record can be used to intercept misdirected corporate e-mails and it can generate fuzzy hashes of the web pages to see if they are live phishing sites. Note: Along with the length of the domain, the number of variants generated by the algorithms increases considerably and therefore the number of DNS queries needed to verify them. For example, to check all variants for google.com, you would have to send over 300k queries. For the domain facebook.com the number increases to over 5 million. How easy it is to guess it takes a lot of resources and most importantly even more time. For longer domains checking all is simply not possible. For this reason, this tool generates and checks domains very close to the original. Theoretically, these are the most attractive domains from the attacker's point of view. However, be aware that the imagination of the aggressors is unlimited. Alternately, you can use Python tooling. This can be done within a virtual environment to avoid conflicts with other installations. However, you will still need a couple of libraries installed at the system level. This is going to install dnstwist.py as dnstwist only, along with all requirements mentioned above. The usage is the same, you can just omit the file extension, and the binary will be added to PATH. To start, it's a good idea to enter only the domain name as an argument. The tool will run it through its fuzzing algorithms and generate a list of potential phishing domains with the following DNS records: A, AAAA, NS and MX. Usually generated list of domains has more than a hundred of rows - especially for longer domain names. In such cases, it may be practical to display only registered (resolvable) ones using --registered argument. Manually checking each domain name in terms of serving a phishing site might be time-consuming. To address this, dnstwist makes use of so-called fuzzy hashes (context triggered piecewise hashes). Fuzzy hashing is a concept which involves the ability to compare two inputs (in this case HTML code) and determine a fundamental level of similarity. This unique feature of dnstwist can be enabled with --ssdeep argument. For each generated domain, dnstwist will fetch content from responding HTTP server (following possible redirects) and compare its fuzzy hash with the one for the original (initial) domain. The level of similarity will be expressed as a percentage. Please keep in mind it's rather unlikely to get 100% match for a dynamically generated web page, but each notification should be inspected carefully regardless of the percentage level. In some cases, phishing sites are served from a specific URL. If you provide a full or partial URL address as an argument, dnstwist will parse it and apply for each generated domain name variant. This ability is obviously useful only in conjunction with fuzzy hashing feature. Very often attackers set up e-mail honeypots on phishing domains and wait for mistyped e-mails to arrive. In this scenario, attackers would configure their server to vacuum up all e-mail addressed to that domain, regardless of the user it was sent towards. Another dnstwist feature allows to perform a simple test on each mail server (advertised through DNS MX record) in order to check which one can be used for such hostile intent. Suspicious servers will be marked with SPYING-MX string. Please be aware of possible false positives. Some mail servers only pretend to accept incorrectly addressed e-mails but then discard those messages. This technique is used to prevent a directory harvest attack. Not always domain names generated by the fuzzing algorithms are sufficient. To generate even more domain name variants please feed dnstwist with a dictionary file. Some dictionary samples with a list of the most common words used in targeted phishing campaigns are included. Feel free to adapt it to your needs. Apart from the default nice and colorful text terminal output, the tool provides two well known and easy to parse output formats: CSV and JSON. Use it for data interchange. The tool is shipped with built-in GeoIP database. Use --geoip argument to display geographical location (country name) for each IPv4 address.